Greg Tansey left Aberdeen for St Mirren last month. 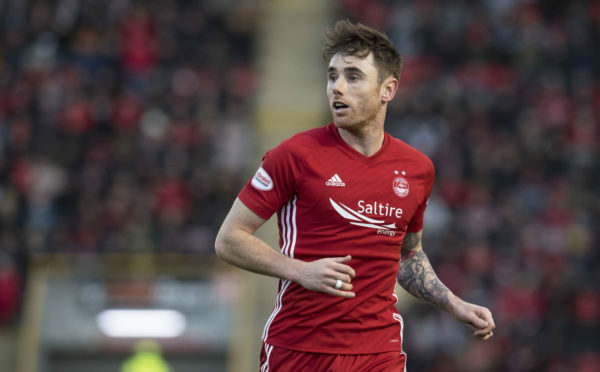 Greg Tansey will be out to prove a point on his return to Pittodrie on Saturday, according to former Aberdeen and St Mirren defender Lee Mair. An injury-hit 18 months as an Aberdeen player came to an end for Tansey last month, ending his contract with the Dons and signing for Saturday’s opponents St Mirren until next year. A long-term hernia problem blighted Tansey’s time in the Granite City, which required three operations and kept him out of football for nine months. He made 14 appearances last season before a winter loan move to Ross County, which only yielded a further three games as he could no longer play through the pain barrier. Tansey has since played six times for Oran Kearney’s side and will return to Pittodrie eager to showcase his talent again. Mair said: “He had a tough time through injury (at Aberdeen) and when you go back to your old club, there’s an extra incentive to try 10 per cent harder. St Mirren are sitting bottom of the league and fighting for their lives anyway, but he will have that incentive, where he maybe feels he’s not had a fair crack of the whip. He’ll want to show he can play for a team at the top of the league. Tansey joined Aberdeen from Caley Thistle at the start of last season, after a previous failed attempt to bring him along the A96 in January 2016. Lee Mair (left) tackles Aberdeen’s Peter Pawlett in 2013. Given the position of the two teams in the table, Mair reckons it is a bigger game for the Buddies, who are three points adrift at the foot of the Premiership with just three wins all season. He added: “They find themselves a wee bit adrift just now and are away to Hearts after going to Pittodrie. They need to start picking up points somewhere. “Their record at Pittodrie is atrocious; I remember winning there when we had to, to stay in the league, and it was our first win there for more than 20 years.